Enabling your passcode deters unauthorised personnel from accessing your journal. Your passcode will reset once you reinstall the application. If you lose your device, please change your Google password immediately. Synchronisation/downloading of data with Google Drive halts after the Google password is changed successfully. You can also consider wiping the data in Android remotely (See link). Google password: Google password allows users to download journal data into their respective device. Journey passcode: Journey passcode prevents unauthorised person from accessing the application. Example scenario: If you lose your device, simply please change your Google password. Even if an unauthorised person tries to access your device, he is unable to access it due to the Journey passcode. If he tries to reinstall the app, synchronisation will not proceed in your lost device since you have already changed the Google password. We’ve also enhanced security in Journey’s ecosystem. Now, you can also view the “Recently used devices” from Journey.Cloud and Journey Android (Dashboard). If you have forgotten your passcode, you can simply reinstall Journey, which will allow you to reset your 4 digit PIN. Before reinstalling, please go to Journey.Cloud and check that all the entries that you have made are visible on Journey.Cloud . If your some of your entries are missing, please press the sync button that is available on the lock screen and wait for syncing to complete before you reinstall the app. We will not be responsible for any lost data if you do not check that they have already been synced before reinstalling Journey. Please exit the app by pressing the “Back” button to lock the app immediately. Otherwise, if you switch out of Journey into another app, Journey will lock itself within a few minutes. 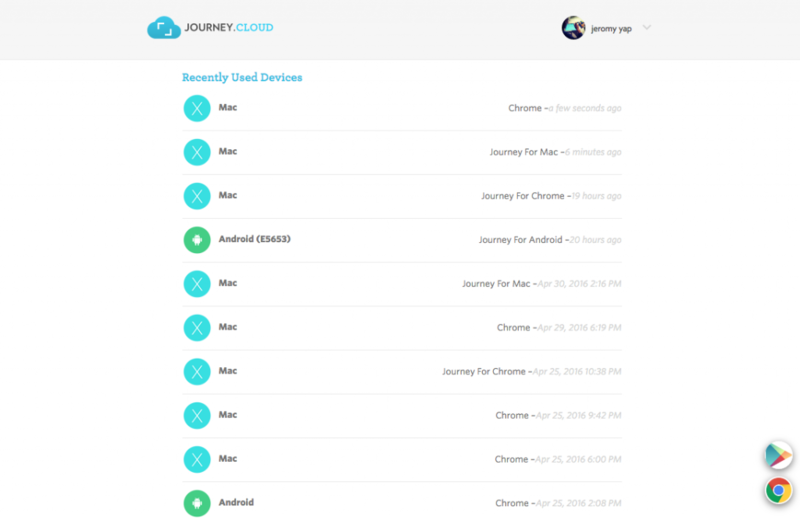 Please note that Journey supports the official Android 6.0 fingerprint API. Fingerprint is only supported in the Android version. To insert passcode, go to “Settings” (gear icon) and select “Passcode”. Input twice to confirm the new passcode. Fingerprint is not supported in the desktop version. This entry was posted in Journey Android, Journey Chrome desktop, Journey.Cloud.